The western honey bee or European honey bee (Apis mellifera) is a species of honey bee. The genus Apis is Latin for “bee”, andmellifera comes from Latin melli- “honey” and ferre “to bear”—hence the scientific name means “honey-bearing bee”. The name was coined in 1758 by Carolus Linnaeus who, upon realizing the bees do not bear honey, but nectar, tried later to correct it to Apis mellifica(“honey-making bee”) in a subsequent publication. However, according to the rules of synonymy in zoological nomenclature, the older name has precedence. As of October 28, 2006, the Honey Bee Genome Sequencing Consortium fully sequenced and analyzed the genome of Apis mellifera. 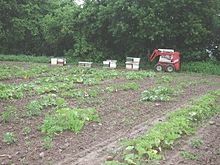 In 2007, media attention focused on colony collapse disorder, a decline in European honey bee colonies in a minority of regions of North America. The western honey bee is native to the continents of Europe, Asia, and Africa. As of the early 1600s, the insect was introduced to North America, with subsequent introductions of other European subspecies two centuries later. Since then, they have spread throughout the Americas. Western honey bees differentiated into geographic races as they spread from Africa into Eurasia. Currently, 28 subspecies based on these geographic variations are recognized. All races are cross-fertile, though reproductive adaptations may make crossing unlikely. The 28 subspecies can be assigned to one of four major branches based on work by Ruttner, and subsequently confirmed by analysis of mitochondrial DNA. African subspecies are assigned to branch A, northwest European subspecies to branch M, southwest European subspecies to branch C, and Mideast subspecies to branch O. The subspecies are grouped and listed in the sidebar. Regions with localized variations may become identified subspecies in the near future, such as A. m. pomonella from the Tian Shan Mountains, which would be included in the Mideast subspecies branch. Geographic isolation led to numerous adaptations as honey bees spread after the last ice age. These adaptations include brood cycles synchronized with the bloom period of local flora, forming a winter cluster in colder climates, migratory swarming in Africa, enhanced foraging behavior in desert areas, and numerous other inherited traits. In the temperate zone, honey bees survive winter as a colony, and the queen begins egglaying in mid to late winter, to prepare for spring. This is most likely triggered by longer day length. She is the only fertile female, and deposits all the eggs from which the other bees are produced. Except for a brief mating period when she may make several flights to mate with drones, or if she leaves in later life with a swarm to establish a new colony, the queen rarely leaves the hive after the larvae have become full-grown bees. The queen deposits each egg in a cell prepared by the worker bees. The egg hatches into a small larva which is fed by ‘nurse’ bees (worker bees which maintain the interior of the colony). After about a week, the larva is sealed up in its cell by the nurse bees and begins the pupal stage. After another week, it will emerge an adult bee. For the first 10 days of their lives, the female worker bees clean the hive and feed the larvae. After this, they begin building comb cells. 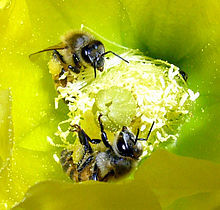 On days 16 through 20, a worker receives nectar and pollen from older workers and stores it. After the 20th day, a worker leaves the hive and spends the remainder of its life as a forager. The population of a healthy hive in mid-summer can average between 40,000 and 80,000 bees. 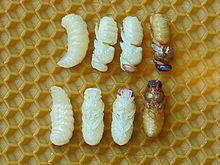 The larvae and pupae in a frame of honeycomb are referred to as frames of brood and are often sold (with adhering bees) by beekeepers to other beekeepers to start new beehives. 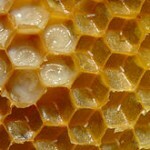 Both workers and queens are fed “royal jelly” during the first three days of the larval stage. Then workers are switched to a diet of pollen and nectar or diluted honey, while those intended for queens will continue to receive royal jelly. This causes the larva to develop to the pupa stage more quickly, while being also larger and fully developed sexually. Queen breeders consider good nutrition during the larval stage to be of critical importance to the quality of the queens raised, with good genetics and sufficient number of matings also being factors. During the larval and pupal stages, various parasites can attack the pupa/larva and destroy or damage it. Queens are not raised in the typical horizontal brood cells of the honeycomb. The typical queen cell is specially constructed to be much larger, and has a vertical orientation. However, should the workers sense the old queen is weakening, they will produce emergency cells known as supersedure cells. These cells are made from a cell with an egg or very young larva. These cells protrude from the comb. As the queen finishes her larval feeding, and pupates, she moves into a head downward position, from which she will later chew her way out of the cell. At pupation, the workers cap or seal the cell. Just prior to emerging from their cells, young queens can often be heard “piping”. The purpose of this sound is not yet fully understood. Worker bees are infertile females, but in some circumstances, generally only in times of severe stress or with the loss or injury or declining health of the queen, they may layinfertile eggs, and in some subspecies these eggs may actually be fertile. However, since the worker bees are ‘imperfect’ females (not fully sexually developed), they do not mate with drones. Any fertile eggs they lay would be haploid, having only the genetic contribution of their mother, and in honey bees these haploid eggs will always develop into drones. Worker bees also secrete the wax used to build the hive, clean and maintain the hive, raise the young, guard the hive and forage for nectar and pollen. In honey bees, the worker bees have a modified ovipositor called a stinger with which they can sting to defend the hive, but unlike other bees of any other genus (and even unlike the queens of their own species), the stinger is barbed. Contrary to popular belief, the bee will not always die soon after stinging: this misconception is based on the fact that a bee will usually die after stinging a human or other mammal. The sting and associated venom sac are modified so as to pull free of the body once lodged (autotomy), and the sting apparatus has its own musculature and ganglion which allow it to keep delivering venom once detached. This complex apparatus, including the barbs on the sting, is presumed to have evolved specifically in response to predation by vertebrates, as the barbs do not function (and the sting apparatus does not detach) unless the sting is embedded in elastic material. Even then, the barbs do not always “catch”, so a bee may occasionally pull the sting free and either fly off unharmed, or sting again. Drones are the male bees of the colony. Since they do not have ovipositors, they also do not have stingers. 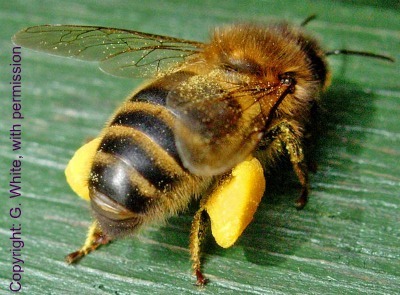 Drone honey bees do not forage for nectar or pollen. In some species, they are suspected of playing a contributing role in the temperature regulation of the hive. The primary purpose of a drone bee is to fertilize a new queen. Multiple drones will mate with any given queen in flight, and each will die immediately after mating; the process of insemination requires a lethally convulsive effort. 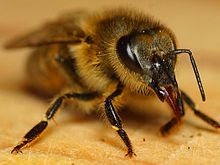 Drone honey bees are haploid (having single, unpaired chromosomes) in their genetic structure and are descended only from their mother, the queen. They truly do not have a father. In essence, drones are the equivalent of flying gametes. In regions of temperate climate, the drones are generally expelled from the hive before winter and left to die of cold and starvation, since they are unable to forage, produce honey, or take care of themselves. The average lifespan of the queen in most subspecies is three to four years. However, reports from the German/European black bee subspecies previously used for beekeeping, indicate the queen could live up to eight years. Because queens deplete their store of sperm, towards the end of their lives, they start laying more and more unfertilized eggs. Beekeepers therefore frequently change queens every year or every other year. The lifespan of the workers varies drastically over the year in places with an extended winter. Workers born in the spring and summer will work hard and live only a few weeks, whereas those born in the autumn will stay inside for several months as the colony clusters. On average during the year, about one percent of a colony’s worker bees die naturally per day. Except for the queen, all of the colony’s workers are therefore exchanged about every four months. 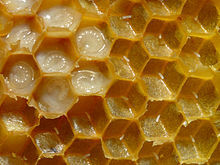 Bees produce honey by collecting nectar, which is a clear liquid consisting of nearly 80% water, with complex sugars. The collecting bees store the nectar in a second stomach and return to the hive, where worker bees remove the nectar. The worker bees digest the raw nectar for about 30 minutes using enzymes to break up the complex sugars into simpler ones. Raw honey is then spread out in empty honeycomb cells to dry, which reduces the water content to less than 20%. When nectar is being processed, honey bees create a draft through the hive by fanning with their wings. Once dried, the cells of the honeycomb are sealed (capped) with wax to preserve the honey. When a hive detects smoke, many bees become remarkably nonaggressive; this is speculated to be a defense mechanism. Wild colonies generally live in hollow trees, and when bees detect smoke, they are assumed to prepare to evacuate from a forest fire, carrying as much food reserve as they can. To do this, they will go to the nearest honey storage cells and gorge on honey. In this state, they are quite docile, since defense from predation is less important than saving as much food as possible. The honey bee needs an internal body temperature of 35 °C (95 °F) to fly — which is also the temperature maintained within the cluster. The same temperature is required in the brood nest over a long period to develop the brood, and it is the optimal temperature for the creation of wax. The temperature on the periphery of the cluster varies with the outside air temperature and in the winter cluster, the internal temperature may be as low as 20–22 °C (68–72 °F). Honey bees are able to forage over a 30 °C (54 °F) range of air temperature, largely because they have behavioral and physiological mechanisms for regulating the temperature of their flight muscles. From very low to very high air temperatures, the successive mechanisms are: shivering before flight and stopping flight for additional shivering, passive body temperature regulation in a comfort range that is a function of work effort, and finally, active heat dissipation by evaporative cooling from regurgitated honey sac contents. The body temperatures maintained differ depending on caste and expected foraging rewards. The optimal air temperature for foraging is 22–25 °C (72–77 °F). During flight, the rather large flight muscles create heat, which must dissipate. The honey bee uses a form of evaporative cooling to release heat through its mouth. Under hot conditions, heat from the thorax is dissipated through the head; the bee regurgitates a droplet of hot internal fluid — a “honey-crop droplet” – which immediately cools the head temperature by 10 °C (18 °F). Below 7–10 °C (45–50 °F), bees become immobile, and above 38 °C (100 °F), their activity slows. Honey bees can tolerate temperatures up to 50 °C (122 °F) for short periods. The colony becomes space-constrained because the hive is filled with honey, leaving little room for new eggs. This will trigger a swarm where the old queen will take about half the worker bees to found a new colony, leaving the new queen with the other half of worker bees to continue the old colony. The old queen begins to fail. This is thought to be recognized by a decrease in queen pheromones throughout the hive. This situation is called supersedure; at the end of the supersedure, the old queen is generally killed. The old queen dies suddenly. This situation is known as emergency supersedure. The worker bees will find several eggs or larvae of the right age-range, and attempt to develop them into queens. 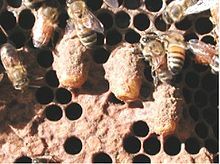 Emergency supersedure can generally be recognized because the new queen cells are built out from regular cells of the comb rather than hanging from the bottom of a frame. Regardless of the trigger, the workers develop the larvae into queens by continuing to feed them royal jelly, which triggers an extended development as a pupa. When the virgin queen emerges, she is commonly thought to seek out other queen cells and sting the infant queens within. Should two queens emerge simultaneously, they are thought to fight to the death. Recent studies, however, have indicated as many as 10% of Apis mellifera colonies may maintain two queens. The mechanism by which this occurs is not yet known, but it has been reported to occur more frequently in some South African subspecies. Regardless, the queen asserts her control over the worker bees through the release of a complex suite of pheromones called queen scent. Peanut-like queen brood cells are extended outward from the brood comb. After several days of orientation within and around the hive, the young queen flies to a drone congregation point (a site near a clearing and generally about 30 feet (9.1 m) above the ground), where the drones from different hives tend to congregate in a swirling aerial mass. Drones detect the presence of a queen in their congregation area by her smell, and then find her by sight and mate with her in midair (drones can be induced to mate with “dummy” queens if they have the queen pheromone applied). A queen will mate multiple times and may leave to mate several days in a row, weather permitting, until her spermatheca is full. The queen lays all the eggs in a healthy colony. The number and pace of egg-laying is controlled by weather, availability of resources and the characteristics of the specific race of honey bee. Queens generally begin to slow egg-laying in the early fall and may even stop during the winter. Egg-laying will generally resume in late winter as soon as the days begin to get longer and peak in the spring. At the height of the season, the queen may lay over 2500 eggs per day – more than her own body mass. The queen fertilizes each egg as it is being laid into a worker-sized cell using stored sperm from the spermatheca. Eggs laid into drone-sized (larger) cells are left unfertilized. The unfertilized eggs have only half as many genes as the queen or worker eggs and develop into drones. In instances where a fertile female worker produces drones, a conflict arises between her interests and those of the queen. 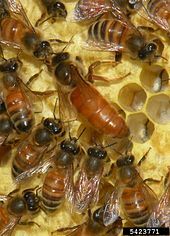 The worker shares half of her genes with the drone and a quarter with her brothers, favouring her own offspring over those of the queen. The queen, however, shares half of her genes with her sons and only a quarter with the sons of fertile female workers. This situation pits the interest of the worker against those of the queen and other workers, who will each try to maximize their reproductive fitness by rearing the offspring most related to them. This relationship leads to the phenomenon known as “worker policing”. In these rare situations, other worker bees in the hive which are more genetically related to the queen’s sons than those of the fertile workers and will actively patrol the hive and remove the worker-laid eggs. Another form of worker-based policing is aggression toward the fertile females. Some studies have suggested the presence of a queen pheromone that may aid workers in discrimination of worker and queen-laid eggs, whereas other studies claim that egg viability is the key difference in eliciting the behaviour. Worker policing is an example of forced altruism, in which the benefits of worker reproduction are reduced and the benefit of rearing the queen’s offspring are raised. In very rare instances, workers can subvert the policing mechanisms of the hive and lay eggs that are removed at a lower rate by other workers, a condition termed the “anarchic syndrome”. Anarchic workers can activate their ovaries at a higher rate and contribute a greater proportion of males to the hive. Although an increase in the number of drones would decrease the overall productivity of the hive, the reproductive fitness of the mother of the drones would greatly increase. Thus, the anarchic syndrome is an example of selection working at both the individual and group levels in opposite directions for hive stability. Under ordinary circumstances, the death or removal of a queen is sufficient to increase reproduction in workers. A significant proportion of the workers will have active ovaries in the absence of a queen. The workers of the hive produce a last batch of drones before the hive eventually collapses. During this period, worker policing is noticeably absent. However, in certain groups of bees, worker policing continues. The European honey bee is the third insect, after the fruit fly and the mosquito, to have its genome mapped. According to the scientists who analysed its genetic code, the honey bee originated in Africa and spread to Europe in two ancient migrations. They have also discovered the number of genes related to smell outnumber those for taste, and they have fewer genes for immunity than the fruit fly and the mosquito. The genome sequence revealed several groups of genes, particularly the genes related to circadian rhythms, were closer to vertebrates than other insects. Genes related to enzymes that control other genes were also vertebrate-like. The genome is unusual in having very few transposons, while they have been present in the evolutionary past (inactive remains were found) and in general evolved slower than in Diptera species. Honey bees use special pheromones, or chemical communication, for almost all behaviors of life. Such uses include (but are not limited to): mating, alarm, defense, orientation, kinand colony recognition, food production, and integration of colony activities. Pheromones are thus essential to honey bees for their survival. Honey bees are an excellent animal species to study with regard to behaviour because they are abundant and familiar to most people. An animal that is disregarded every day has very specific behaviours that go unnoticed by the normal person. Karl von Frisch, who was awarded the Nobel Prize for physiology and medicine in 1973 for his study of honey bee communication, noticed bees communicate through the language of dance. Honey bees are able to direct other bees to food sources through the round dance and the waggle dance. The round dance tells the other foragers that food is within 50 meters of the hive, but it does not provide much information regarding direction. The waggle dance, which may be vertical or horizontal, provides more detail about both the distance and the direction of the located food source. Bees also are thought to rely on their olfactory sense to help locate the food source once the foragers are given directions from the dances. Another signal for communication is the shaking signal, also known as the jerking dance, vibration dance, or vibration signal. It is a modulatory communication signal because it appears to manipulate the overall arousal or activity of behaviours. The shaking signal is most common in worker communication, but it is also evident in reproductive swarming. A worker bee vibrates its body dorsoventrally while holding another honey bee with its front legs. Jacobus Biesmeijer examined the incidence of shaking signals in a forager’s life and the conditions that led to its performance to investigate why the shaking signal is used in communication for food sources. Biesmeijer found that the experienced foragers executed 92.1% of the observed shaking signals. He also observed that 64% of the shaking signals were executed by experienced foragers after they had discovered a food source. About 71% of the shaking signal sessions occurred after the first five foraging success within one day. Then other communication signals, such as the waggle dance, were performed more often after the first five successes. Biesmeijer proved that most shakers are foragers and that the shaking signal is most often executed by foraging bees over pre-foraging bees. Beismeijer concluded that the shaking signal presents the overall message of transfer work for various activities or activity levels. Sometimes the signal serves to increase activity, when bees shake inactive bees. At other times, the signal serves as an inhibitory mechanism such as the shaking signal at the end of the day. However, the shaking signal is preferentially directed towards inactive bees. All three types of communication between honey bees are effective in their jobs with regards to foraging and task managing. The honey bee is a colonial insect that is often maintained, fed, and transported by beekeepers. Honey bees do not survive individually, but rather as part of the colony. Reproduction is also accomplished at the colony level. Colonies are often referred to as super organisms. Honey bees collect flower nectar and convert it to honey which is stored in their hives. The nectar is transported in the stomach of the bees, and is converted to honey through the addition of various digestive enzymes, and by being stored in a “honey cell” and then partially dehydrated. Nectar and honey provide the energy for the bees’ flight muscles and for heating the hive during the winter period. Honey bees also collect pollen which supplies protein and fat for bee brood to grow. Centuries of selective breeding by humans have created honey bees that produce far more honey than the colony needs. Beekeepers, also known as “apiarists,” harvest the honey. Beekeepers often provide a place for the colony to live and to store honey. There are seven basic types of beehive: skeps, Langstroth hives, top-bar hives, box hives, log gums, D.E. hives and miller hives. All U.S. states require beekeepers to use movable frames to allow bee inspectors to check the brood for disease. This allows beekeepers to keep the Langstroth, top-bar, and D.E. hives freely, but other types of hives require special permitting, such as for museum use. The type of beehive used significantly impacts colony health and wax and honey production. Modern hives also enable beekeepers to transport bees, moving from field to field as the crop needs pollinating and allowing the beekeeper to charge for the pollination services they provide. In cold climates some beekeepers have kept colonies alive (with varying success) by moving them indoors for winter. While this can protect the colonies from extremes of temperature and make winter care and feeding more convenient for the beekeeper, it can increase the risk of dysentery (see the Nosema section ofdiseases of the honey bee) and can create an excessive buildup of carbon dioxide from the respiration of the bees. Recently, inside wintering has been refined by Canadian beekeepers, who build large barns just for wintering bees. Automated ventilation systems assist in the control of carbon dioxide build-up. Numerous traits are present in the various subspecies of honeybees that are amenable to selection via breeding. This listing covers a small part of the variation present in the honeybee genome. 1. Egg Laying Rate – Queen can lay a few hundred eggs per day up to about 5,000 eggs per day. 2. Egg Viability Rate – Can range from 0 up to 100% of eggs that hatch and develop into bees. 3. Brood Cycle Length – For worker bees ranges from 17 days up to 21 days. 4. Brood Nurturing – This is a measure of how intent the nurse bees are at nurturing brood. 5. Foraging Aggressiveness – This trait determines potential for honey production. 6. Time Of Foraging – Some bees forage earlier in the day and later in the evening than others. 7. Disease Resistance – This is a measure of innate tolerance to brood diseases and adult diseases. 8. Pest Resistance – This is a measure of innate tolerance to pests such as tracheal and varroa mites. 9. Defensive Behavior – Determines aggressiveness and stinging propensity. 10. Swarming Tendency – This determines the timing and success of colony reproduction. 11. Winter Hardiness – Clustering behavior and ability to survive extended low temperatures. 12. Life Span – Ranges from a 22 days up to 305 days for workers with an average of 36 days. 13. Body Size – Small bees are typical in Africa with larger bees typical in colder climates. 14. Sense Of Smell – Ability to detect flower odors and respond to nectar availability. 15. Hygienic Cleaning Behavior – This is a major component of both disease and pest resistance. 16. Time Of Brood Development – Bees must begin brood rearing at least 8 weeks before nectar flows. 17. Thrift – Adjustment of brood production to available food sources for efficient use of resources. 18. Honey Arrangement – Storing honey closer to or further away from the brood next. 19. Pollen Collection – Amount and floral source of pollen are under direct genetic control. 20. Type Of nectar Collected – This has a major impact on honey quality and value. 21. Comb Building – Willingness to build comb and expand the colony. 22. Capping Structure – Ranges from flat and watery to gray to white dome shaped cappings. 23. Propolis Collection – Associated with wintering success, ranges from none to covering all hive surfaces. 24. Brace Comb Construction – Ranges from very little to cross comb throughout the colony. 25. Abdominal Color – Ranges from black to various color stripes in tan, yellow, and orange. 26. Antennae Structure – Number and placement of sensors is inherited, associated with sense of smell. 27. Number of Drones Produced – Ranges from very few up to ¼ of brood combs. 28. Number of Queens Produced – Ranges from a few up to several hundred. One of the primary products is more honeybees. Honey bees are bought and sold as mated queens, in spring packages of a queen with 2 to 5 pounds of bees, as nucleus colonies which include frames of brood, and as full colonies of bees. Commercial sale of bees dates to prehistory. Modern methods of producing queens and dividing colonies for increase date to the late 1800s. Bees are typically produced in temperate to tropical regions and sold to colder areas, as for example packages of bees produced in Florida and sold to beekeepers in Michigan. The honey bee’s primary commercial value is as a pollinator of crops. Orchards and fields have grown larger; at the same time wild pollinators have dwindled. In several areas of the world the pollination shortage is compensated by migratory beekeeping, with beekeepers supplying the hives during the crop bloom and moving them after bloom is complete. In many higher latitude locations it is difficult or impossible to winter over enough bees, or at least to have them ready for early blooming plants, so much of the migration is seasonal, with many hives wintering in warmer climates and moving to follow the bloom to higher latitudes. As an example, in California, the pollination of almonds occurs in February, early in the growing season, before local hives have built up their populations. Almond orchards require two hives per acre (2,000 m² per hive) for maximum yield and so the pollination is highly dependent upon the importation of hives from warmer climates. Almond pollination, which occurs in February and March, is the largest managed pollination event in the world, requiring more than one third of all the managed honey bees in the United States. Massive movement of honey bee are also made for apples in New York, Michigan, and Washington. And despite the inefficiency of honey bees in pollinating blueberries, huge numbers are also moved to Maine for blueberries, because they are the only pollinators that can be relatively easily moved and concentrated for this and other monoculture crops. Commercial beekeepers plan their movements and their wintering locations with prime reference to the pollination services they plan to perform. Bees, as well as some other insects, are particularly beneficial as pollinators to most plants, as they maintain flower constancy, which means they are more likely to transfer pollen to other conspecific plants. Also, flower constancy prevents the loss of pollen during interspecific flights and pollinators from clogging stigmas with pollen of other flower species. Honey is the complex substance made when the nectar and sweet deposits from plants and trees are gathered, modified and stored in the honeycomb by honey bees. Honey is a complex biological mixture that consists mostly of inverted sugars, primarily glucose and fructose. It has antibacterial and antifungal properties and will not rot or ferment when stored under normal conditions. However, honey will crystallize with time. Crystallized honey is not damaged or defective in any way, for human use, but bees will automatically remove crystallized honey from their hive and discard it, since they can only use liquid honey. Worker bees of a certain age will secrete beeswax from a series of glands on their abdomen. They use the wax to form the walls and caps of the comb. When honey is harvested, the wax can be gathered to be used in various wax products like candles and seals. See movie of bee at work collecting pollen. Requires an Ogg Theora enabled browser or player, such as Firefox orVideoLAN. Bees collect pollen in the pollen basket and carry it back to the hive. There, pollen is used as a protein source necessary during brood-rearing. 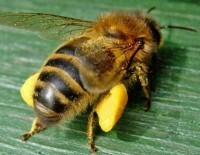 In certain environments, excess pollen can be collected from the hives. It is often eaten as a health supplement. Propolis is a resinous mixture that honey bees collect from tree buds, sap flows, or other botanical sources. It is used as a sealant for unwanted open spaces in the hive. Propolis is marketed for its alleged health benefits, but may cause severe allergic reactions in some individuals. Royal jelly is a honey bee secretion that is used in the nutrition of the larvae. It is marketed for its alleged health benefits, but may cause severe allergic reactions in some individuals. European honey bee populations have recently faced threats to their survival. North American and European populations were severely depleted by varroa mite infestations in the early 1990s, and US beekeepers were further affected by colony collapse disorder in 2006 and 2007. Chemical treatments against Varroa mites saved most commercial operations and improved cultural practices. New bee breeds are starting to reduce the dependency on miticides (acaracides) by beekeepers. Feral bee populations were greatly reduced during this period but now are slowly recovering, mostly in areas of mild climate, owing to natural selection for Varroa resistance and repopulation by resistant breeds. Further, insecticides, particularly when used in violation of label directions, have also depleted bee populations, while various bee pests and diseases are becoming resistant to medications (e.g. American foulbrood,tracheal mites and Varroa mites). 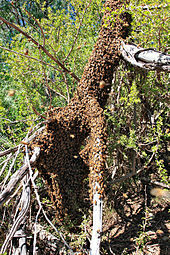 A bee swarm. Bees are remarkably non-aggressive in this state as they have no hive to protect, and can be captured with ease. In North America, Africanized bees have spread across the southern United States where they pose a small danger to humans, although they may make beekeeping difficult and potentially dangerous (particularly hobby beekeeping). As an invasive species, feral honey bees have become a significant environmental problem in places where they are not native. Imported bees may compete with and displace native bees and birds, and may also promote the reproduction of invasive plants that native pollinators do not visit. Also, unlike native bees, they do not properly extract or transfer pollen from plants with poricidal anthers (anthers that only release pollen through tiny apical pores), as this requires buzz pollination, a behavior which honey bees rarely exhibit. For example, honey bees reduce fruiting in Melastoma affine (a plant with poricidal anthers) by robbing stigmas of previously deposited pollen.